When trainer Murray Baker tells you he has a filly with a touch of class about her, it pays to take notice. Baker holds that opinion of the royally-bred Savabeel three-year-old Queen Of Diamonds who gave a glimpse of that potential when she crushed her rivals in the Gr.3 Lawnmaster Eulogy Stakes (1550m) at Awapuni. Sent out favourite in the eight-horse field after a dominant performance to break her maiden status at Te Rapa last month, Queen Of Diamonds never looked in danger of defeat thanks to a canny ride from leading jockey Lisa Allpress. Allpress had her charge idling along nicely in the trail behind a moderate tempo set by Matamata visitor Rocket Fuel. Angled into the clear on the point of the home turn, Queen Of Diamonds quickly put a winning break on her nearest pursuers as she coasted to the line a clear two and three-quarter lengths ahead of the field. 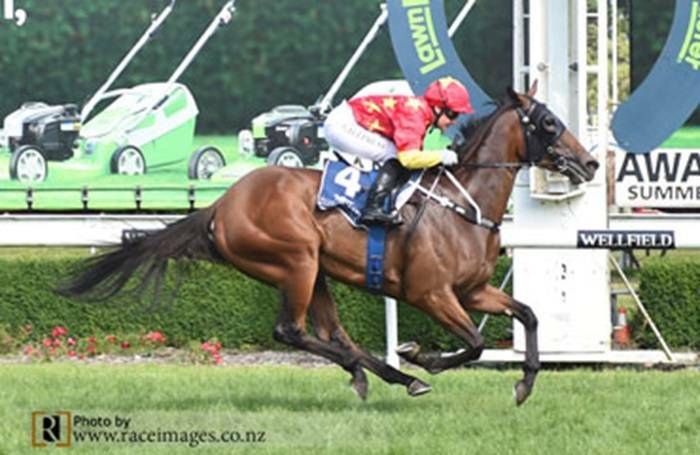 “She is a very nice filly, a very classy individual,” Baker said shortly after stablemate Mongolian Marshal had taken out the Gr.3 SkyCity Hamilton Waikato Cup (2400m) at Te Rapa. “I’ve always held her in high regard, but we’ve taken our time with her as I think she has plenty to offer in the future. Baker believes the further the filly goes the better she will be as he and co-trainer Andrew Forsman plot a path towards a Group One target. “We have her nominated for the Levin Classic as well as the Oaks which are both at Trentham so that is where I would like to head with her,” he said. “She was an expensive purchase at the sales so the more black-type we can get with her the better it will be for her owners. Queen of Diamonds is raced by China Horse Club Pty Ltd who secured her for $640,000 from the Cambridge Stud draft at the 2017 National Yearling Sale at Karaka. She is a daughter of Danehill mare Love Diamonds and a younger half-sister to handy racemare Lovetessa (NZ) (O’Reilly) who placed third in the 2015 running of the Eulogy Stakes during a brief career on the track.